A food tour is all well and good, but sometimes you just want to see something really off the beaten path. These six guided tours deliver. 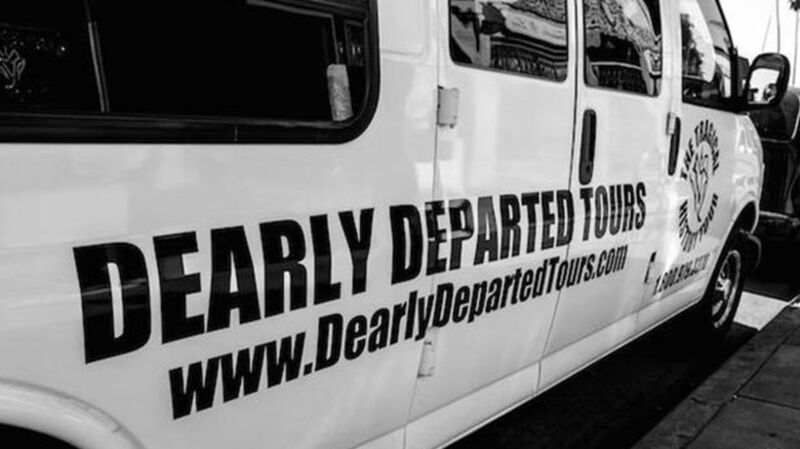 The Dearly Departed Tour is a guided bus tour of Los Angeles that caters to the morbidly curious. It features crime scene photographs, eerie 911 calls, death memorabilia, and visits to the actual locations of celebrity deaths. There's even a three-and-a-half hour Helter Skelter Tour, which retraces the steps of the Manson Family. Before Las Vegas was known as a family-friendly vacation spot, it was a breeding ground for organized crime and murder. The Vegas Mob Tour treats travelers to an inside look at the Mafia and other crime syndicates from the '40s to the '80s, many of whom helped build Sin City. Tours around Las Vegas feature various locations and sites where murders and mob activities occurred, as well as admission to the Mob Museum and Geno's Pizza Party—where the notorious Hole-In-The-Wall Gang planned their crimes and hits. In a failed attempt at pest control, the Argentine government shipped a large number of monk parrots to North America during the 1960s, pitching them as pets to the U.S. consumer market. The USDA halted the scheme after several containers of the parrots broke open at airports and the birds escaped. At least one crate of parrots got free at JFK, and the birds have since made their homes in various spots around Brooklyn. Today, tour guide and parrot enthusiast Steve Baldwin leads walking tours throughout Brooklyn College for those who want to learn more about the exotic birds and how they came to call the borough home. The “wild parrot safaris” are free through the Brooklyn Parrot Society. A catastrophic nuclear accident at the Chernobyl nuclear power plant took place 30 years ago, but now you can safely walk the grounds. The Chernobyl Tour offers a (mostly) radiation-free look at the remnants and debris of the Chernobyl disaster of 1986, including a view of the zones after the accident, survival and migration stories from people who lived through the disaster, and information on surviving a nuclear fallout. The Chernobyl Tour also offers single day or up to seven-day tours of the Chernobyl Zone and the abandoned town of Pripyat. Hawaii's combination of modern cities built right next to burial grounds and ancient rainforests has led some to believe that much of the state is haunted with ghosts and supernatural beings. The Oahu Ghost Tours offer tourists a glimpse of the sacred grounds of Hawaii’s past, featuring a look at the myths and legends of Waikiki, the "Night Marchers," the "Orbs of Oahu," and many other sacred spirits. The Catacombs of Paris are a series of underground tunnels and limestone quarries originally used as a network of mines but later transformed into a burial ground for over 6 million Parisians when cemeteries began to overflow in the 1700s. Now, tourists and travelers can take guided tours of the spooky underground ossuaries, which feature millions of human skeletal remains resting over 65 feet underground in dark cavernous tunnels. Be prepared to do some stair climbing, though: The catacombs also feature about 215 steps to go down and back up to street level.